Simon Løffler’s personality shines through in Ensemble Adapter’s portrait concert while Niels Lyhne Løkkegaard’s conceptual gold piece rings hollow at Gong Tomorrow. Composers Niels Lyhne Løkkegaard and Simon Løffler both put themselves to the fore in their respective concerts at this year’s Gong Tomorrow festival. Neither composer was a soloist – both were onstage performing alongside their musicians, playing an equal role in the execution of their pieces. But both concerts were ‘branded’ so that the composer was the central focus, in varying ways. Løkkegaard’s Music for Krügerrand – Quartet for Gold Bullion Coins (2018) seemed to be everywhere in the run-up to the concert – TV, online articles, newspapers, radio, all covered in a media blitz. Løffler’s profile concert with Ensemble Adapter, by contrast, was less well publicised and discussed, and the audience numbers reflected it. It’s easy to see why. Niels Lyhne Løkkegaard’s concepts naturally lend themselves to this kind of ‘event’ branding. Previous works include, for example, Music for 16 Triangles (2016), Music for 30 Chromatic Tuners (2014) and Music for 9 Pianos (2015), all part of his Sound x Sound series – and, more recently, Potential for 1,000 Recorders (2018). In this instance we were treated to ‘Løkkegaard x Gold’, as the four performers on stage played on gold coins, fed into tone generators. To add to the branding value of this event, the quartet included Saxo Bank co-founder Lars Seier Christensen, whose speech about the history of gold and its fascination to humanity preceded the musical performance. I was, and still am, confused by this concert because I am not sure what angle from which to approach it. The composition itself sounded beautiful, as the ringing of gold coins fed into tone generators is a very nice sound – similar to crotales. But that seemed to be where the piece started and ended, which, of course, may have been Løkkegaard’s intention. Perhaps the sound of the gold coins should be enough, and writing a ‘piece’ with the instruments was not what he had in mind. Which is fair enough – there is always a place for simplicity. But the composition that could be found in the piece belies this approach. We heard one note, then another note, then the same note again, then a third – there was a shape. There was development. There were clearly demarcated sections (at the end, for example, where all the players sat down and the tone generators maintained the sound). This was not music where nothing happened – this was music where what happened didn’t seem to be the focal point. This is not in and of itself a problem, but there was enough of a traditional shape in the music that the intention got muddied. Perhaps the performance itself was supposed to be the focus? A full-on Wagner-style total artwork where all things should be taken into consideration, and the music is just one small component in a much larger machine? But there was such a lack of attention to detail in the piece’s staging that I cannot in good faith take such an approach to Music for Krügerrand. There were just too many facets to the performance that could have been explored in more detail or even just simply cleaned up, but instead were tossed aside unexamined. The contrast between Lars Seier Christensen’s stage presence and that of the two percussionists (one all nerves by his own admission, two consummate steely-eyed professionals) was interesting but left unexplored. It was impossible for audience members to see the gold coins unless they were standing right in front, which the vast majority were not. And the ending of the piece didn’t seem to have been thought out at all – all the performers sat down and stopped playing, but after a couple of minutes Løkkegaard had to stand up and go to the tone generators to turn them off, with his back to the audience. There were other things – a myriad of small details that detracted from the whole to a large extent, and the total package was not conceptually strong enough to forgive these weaknesses. Lars Seier Christensen was the breakout star of the piece, and having him perform onstage after giving his speech was to me the most interesting facet of the performance. He went from inside his comfort zone to leagues outside it in the space of a minute, and there was a kind of sick pleasure in watching this arch-capitalist be uncomfortable around large quantities of gold. One could build a piece just around Christensen himself – he was a game performer and clearly up for it. As it was, Music for Krügerrand lacked focus and got lost in a haze of unclear details and half-explored ideas. Simon Løffler’s portrait concert was, on the whole, much more successful in what it set out to do. 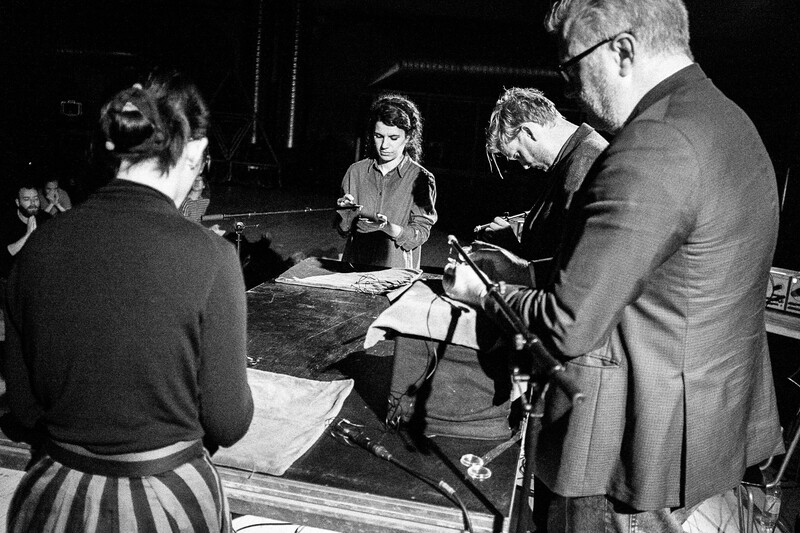 Perhaps the stakes were lower – five works performed by Berlin-based Ensemble Adapter. But in terms of showcasing various sides of Løffler’s artistic personality this concert achieved its goal. There was a lot of personality to show. The music presented here ranged from brazenly extrovert to barely audible. Løffler throws himself wholeheartedly in the execution and sometimes even performance of his pieces. His instrumentation often consists of eccentric, outlandish machines built by the composer himself, and the performances are made up of the interplay between the performer and these bizarre technologies. There is nothing to conceptualise while experiencing Løffler’s work, for it creates its own concept. Nothing is represented – it is all there on the table. We don’t need to be told to think about the ongoing struggle between humanity and technology in today’s society because it is happening onstage in front of us. So no wonder the concert had less media attention than Løkkegaard’s – there is little to discuss and not a lot to ‘sell’ apart from Løffler himself. Much has been made of Løffler’s machine-music pieces, as they have propelled him to successes at the Darmstadt festival in Germany. And without a doubt they are impressive, with enough substance in the music written for them to avoid becoming gimmicks. Concept, composition and execution are inseparably intertwined in this music – the machines are built to make pieces, the pieces are written around the limitations and peculiarities of the machines. 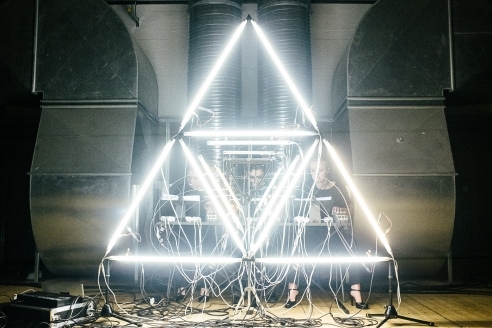 The setup in the three machine pieces was identical – three or four performers sit in a line, facing the audience, each controlling or interacting with their part of the machine. 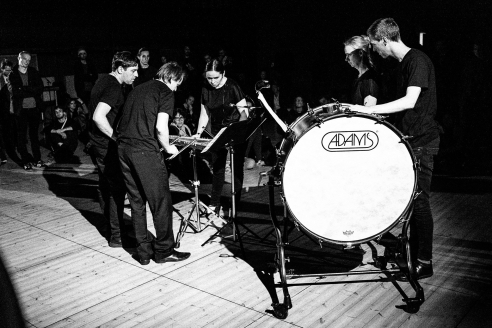 In the first piece, Monodactyl (2016), each performer was assigned one finger, and only performed actions associated with that finger (such as ringing a tiny bell, or clicking a pen, or moving a metronome back and forth). In H (2016) we were presented with four spinning metal bars that the players held tuning forks in front of to be struck. The bars also created their own sounds, as the varying speeds of rotation resulted in different pitches. A third, more dramatic, layer consisted of each player becoming hypnotised by their own bar, and moving their head back and forth with the rhythmic swaying. Løffler approaches his machines from several different angles, explores their possibilities, and assembles the resulting piece out of his experimentation. But eventually it became draining. I hit the wall in the last piece, e (2017), wherein interlocking triangles constructed of flashing and buzzing fluorescent lights were blended with the sound of real triangles. In another concert, where this piece might have been Løffler’s sole representation on the programme, it would have worked. As a showstopper in a portrait concert, it fell flat because it was just more of the same. It’s telling that this was the piece used for promotional images – the triangles make a strong visual. But for me this piece (and its place in the concert order) is emblematic of a charge that could be levied against Løffler – that of a certain archness or hipness. It’s very cool. Everything came off a bit self-aware, sometimes even (in the case of the triangles) a bit on the nose. But it’s not Løffler’s fault that he is of the moment, and the two smaller-scale, quieter, more sensitive pieces on the programme, a (2010) and D (2013), were strange and beautiful in a manner that revealed another side of the composer. a was a short and simple quartet scored for toy piano, Casio keyboard and small glockenspiels – delicate in material and artfully touching in its construction (a difficult balance to pull off). It was also thoughtfully staged, with the performers sitting on the floor amongst the audience to highlight the childlike, amateur-musician features. D, for percussion instruments, had more of a concept behind it, as we were meant to experience the music as if heard through a wall. The contrast created by forcefully playing on glockenspiel with just the fingertips was an intriguing mismatch of sound and visual. For me it was these quieter works that were the most successful, unmasking the thoughtful, delicate and highly structurally aware composer underneath all the bombastic machines. They both complemented and contrasted with the three louder works. Not that the machine-music was any less beautiful in its construction – but the shift in focus in the smaller pieces effectively highlighted the hidden depths of Løffler’s output. What emerged was a methodical yet sensitive composer who was unafraid to take risks and explore the implications raised by his material. A touch cold, perhaps. But if a little detachment is the price to pay for Løffler being Løffler – sold.